We’ll be talking at 5ET, 2PT (about an hour and half from now). Listen live or later on Virtually Speaking Science, or join us in the virtually live studio audience at the Exploratorium’s joint in Second Life, where an implausibly tall and fit Levenson avatar will interrogate Annalee’s robot self. 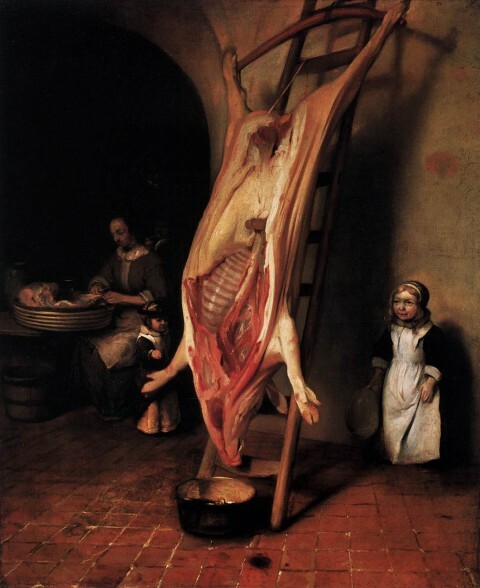 The focus of our chat — death, destruction, and the possibility of slipping the noose. Annalee’s book looks at what it will take for the human species to survive another million years — avoiding the threat of mass extinction along the way. Her book really does two things. For one, it provides a very good short introduction to the science of mass extinction, what we know and how we’ve figured out about the five times in Earth’s history that ~75% or more of all species on the planet went caput. 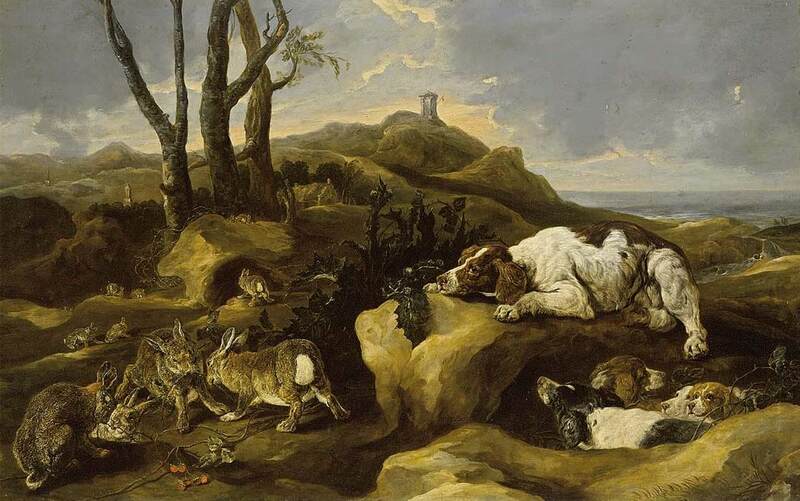 Then in the second half, Annalee examines the threats humankind have already confronted, looks at what that history tells us about current dangers, and writes about the ways we can now think about near and long term escapes from the worst outcomes. It’s a combination (as you’d expect from the mind behind the “We Come From The Future” brigade over at io9) of bravura science writing — imaginative and rigorously grounded accounts of current inquiry — and plausible, exciting speculation. To emphasize: this isn’t a work of speculative writing, fiction or non-fiction. It’s an argument that includes speculation, given its weight through the third element of Annalee’s title: “Remember.” There’s a beautiful section in the middle of the book in which Annalee discusses the science fiction of Octavia Butler. There, she grapples with the nub of the book. Whatever actual path(s) we take, should descendents of 21st century humans persist for geologically noticeable swathes of time, they will do so as one or many species increasingly divergent from our own. What will be human about them, Annalee argues, will turn on the power and persistence of memory. That sounds exactly right to me. Come join us for the chat. Should be fun…and more than that too, I hope. *You can take up that title’s Oxford comma-hood in the comments, if you’re that kind of person. Me, I’m an agnostic. 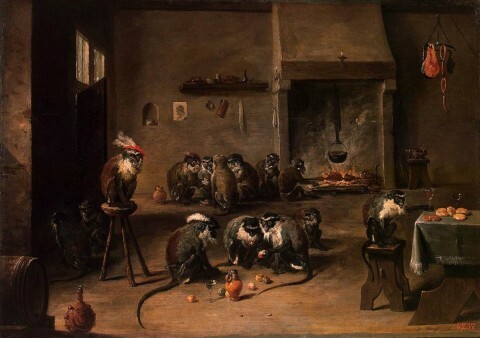 Image: David Teniers the Younger, Apes in the Kitchen, c. 1645. This afternoon at 5 ET I’ll be doing my internet science radio gig as one of three hosts on Virtually Speaking Science. The others, btw, are Alan Boyle and Jennifer Ouellette. My guest will by my MIT colleague Allan Adams. Allan is a physicist — a string theorist, AKA someone who works on problems that have been famously twitted as having no rea world test or validation. That’s a misleading claim on a bunch of levels, some of which are implicated in some recent work Allan and several colleagues have done. The latest, reported in a paper in Science last summer, uses math derived from string theory that’s been applied to the study of black hole dynamics to investigate what happens as a superfluid — a frictionless fluid whose behavior is described by quantum mechanics — displays turbulence. That’s a mouthful, to be sure. Here’s the nub: a mathematical description of one kind of physical system — a black hole — turns out to explicate the behavior of a very different one, that, as it happens, can be produced, observed and analyzed right here at home. …miraculous is the wrong word for it, so perhaps better, astonishing fact about modern science: it really, really works, and it does so through a path that mathematics opens up. We can make sense of our surroundings because of what seems to be an invention of the human mind, a system of logic rigorously expressed that can describe and evolve the relations between ideas, concepts and things in the world. But here’s the weird bit: that tool, that invention of thousands of years of human culture, does so across every more disparate, ever more encompassing domains — from the lab bench to a collapsed star, for example. Mathematics as a creation of fallible humans seems to be in some sense an intrinsic property of the universe, which is a much more banal statement than it appears, in one sense, since what it really says is that mathematical accounts do what people were trying to do with the stuff: find ways to construct arguments in forms that can be checked for accuracy and internal consistency that satisfactorily describe, say, the flight of a cannonball or the path of a planet. So Allan and I are going to talk about all that: his recent work as an example of the unreasonable effectiveness of mathematics; about how physicists actually use math — what kind of thinking actually goes into doing this kind of work; and about why string theory, for any paucity of new prediction or unique evidence in its favor is still such a fertile field of inquiry — and what that fact tells you about how science actually advances. Heady stuff, I know, but I, with my physics degree from the school of having things fall on my head, will keep the conversation working as a way to see into what (a) physicist does. Allan, you’ll find, is great value, that most fortunate of human who finds nothing but joy in the work he does. That’ll come through — the great pleasure of my work is to get to spend time with people who know cool stuff, find out more, and can’t stop talking about it. That’s what you’ll get in just a little while. Tune in if you have a chance, or stop by the Second Life live studio experience, or catch it later as a podcast. 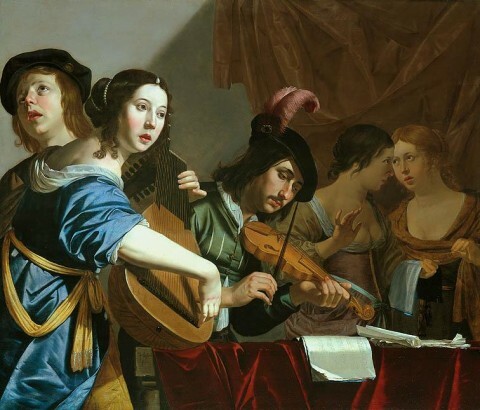 Image: Jan van Bijlert, Musical Company, before 1671. A bit more self-aggrandizement, for which I apologize, but I thought (hoped) y’all might want to know about the conversation I’m going to have with Alan Lightman this afternoon. It will be on the occasion of the publication (yesterday!) of Alan’s latest book, Mr. g: A Novel About The Creation. 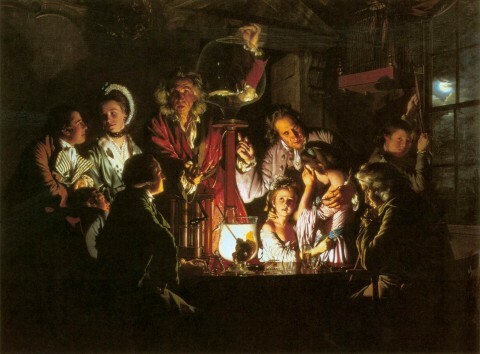 This is my monthly Virtually Speaking Science web/Second-Life cast, and you can listen here. Here’s where to go in Second Life for a “live audience” view. Alan, as many of you know, is both a theoretical physicist and an essayist and novelist of great accomplishment. He’s best known for his marvelous fiction-of-ideas, Einstein’s Dreams, but I’d also point you to his non-fiction, especially his recent, The Discoveries: Great Breakthroughs in 20th Century Science, Including the Original Papers. That’s a work of both great depth and great fun, even if I’ve argued with Alan about his omission of Wegener’s continental drift paper. But back to the matter at hand: Mr. g is a novel in the spirit of Einstein’s Dreams, deeply engaged in ideas, specifically, (at least as I read it), what is the maximum amount of God you can get in a universe that obeys the physical laws we now recognize. To tackle this there are familiar figures: Mr. g himself, and his questioner (the interlocutor from Job, much more than the fallen angel of Paradise Lost). And there are some not-so usual folks, specifically Mr. g’s uncle and aunt. And then there is, after a bit, space and time, universes and the Universe, and an account of what feels to me to be the tragic nature of any possible conception of a deity. We’ll be talking about that, about what makes a work a novel, about the science-religion argument as it plays out in popular culture, and maybe even about what it takes to convey something of scientific lives and thinking to broad audiences, all in more or less an hour. If you’re interested, come on down (or download the podcast once it becomes available–within hours or the day). 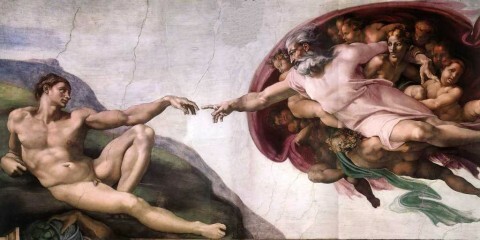 Image: Michealangelo, The Creation of Adam from the Sistine Chapel Ceiling, c. 1511. Inevitable — a cliché, I know. But what are you going to do?